Portal 2 is getting rave reviews from critics (including from us), but it is getting torn to bits by angry gamers over at the review aggregation site Metacritic. The Game of the Year? Not according to furious fans who have saddled the game with an average review score of 4.7 out of 10. You probably won&apos;t read much of this review. They're pissed, and they say they have good reason. 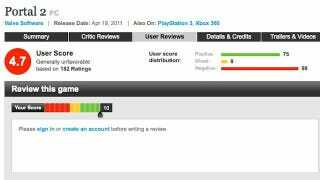 "This game is not worth the hype at all," raged one gamer on Metacritic. "The way Valve has been pushing this I was expecting the second coming of Christ but instead I got a niche, 4 hour long minigame. Worst of all is the cash shop... as if the $45 price tag for the game alone isn't enough." Another groused: "I paid $45 for a full game, but what I got was a stripped-down game and the "opportunity" to buy the $80 worth of DLC [downloadable content] they have available on release day." 2) The PC and Mac versions do include an in-game DLC store. This store is inaccessible in the Xbox 360 version (we're checking the PS3 version once we get our hands on it). All of the DLC is cosmetic and will visually alter the robots you can control in co-op. None grants a player a gameplay advantage or shortcut. The items cost a total of $85.64 though can be purchased in a bundle for $34.99. The items range from 16 $2 co-op gestures (the Atlas Faceplam, for example) to $5 skins for your robot . The console versionof Portal 2 includes eight unlockable free gestures in its co-op campaign. Well, they're free as long as you take into account that the console version costs $10 more than the PC/Mac version. The 16 gestures for the PC version are listed in the in-game's store, $2 a pop. Note the same Atlas disco ball icon in this store and in the console version, a sign that some of what's in the console version appears to cost money in the PC game. Portal 2 will probably be ok, despite the Metacritic slams. Some of the barbs thrown at it may prove to be unjustified; others, especially the concerns about over-priced DLC, may stick. This game is better than a 4.7, but buyer beware if you're concerned about playing time or annoyed about how game companies try to profit from the kind of in-game garnish that used to be free or, in the minds of some, simply should be.